The latest Ride of the Week is a 2013 Buick Encore Premium FWD. The Encore is a compact 5-passenger crossover that debuted for the 2013 model year. Earlier this year I had an opportunity to get an up-close look at the Encore and take a short drive, but it wasn’t enough exposure to really get a sense of what this Buick is all about. I did learn that the Encore is smaller than it looks in photos, though. Before really looking at the Encore and studying its dimensions, mistaking it for a vehicle about the size of the Infiniti EX, another 5-passenger luxury crossover, is easy. In reality, this Buick is actually 14 inches shorter in overall length than the EX. Tidier-than-expected dimensions aside, the Encore otherwise brings the comfort, style and technology I’ve come to expect from modern Buick models. The base-model Encore, priced just under $25,000, comes with a standard IntelliLink infotainment system, 18-inch wheels, a power driver’s seat and a backup camera. All Encore models get a turbocharged 4-cylinder engine and a six-speed automatic transmission.Equipped with the Premium options package, the test car gets many of the features drivers like me want: leather seats with memory functions; auto headlights, wipers and climate control; a forward collision warning system; Bose audio; parking sensors and a backup camera. The test car also includes navigation. One must-have luxury feature, a proximity key, is not included with the Premium package. 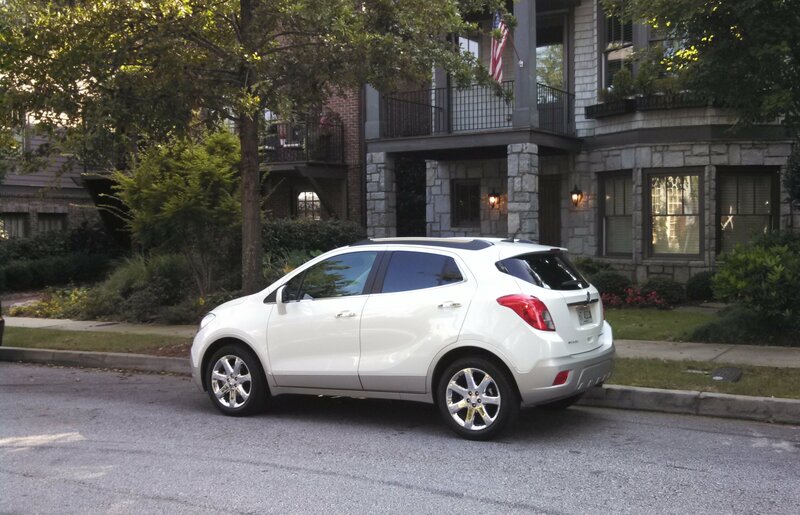 One advantage to the Encore’s smallish size is less workload for it’s little engine. The 1.4-liter turbo makes 138 horsepower and 148 lb-ft torque. Honestly, it feels like more. The engine is capable and responsive; the Encore accelerates briskly and quietly without straining in normal driving. Under hard acceleration, the engine’s sound reveals its size, but any noise is accompanied by a commensurate increase in speed. The small turbo and six-speed yield good fuel economy, too: 25 mpg city and 33 mpg highway. Can this small crossover handle family duty? Will it continue to impress as the week goes on, or will flaws become apparent with more wheel time? And it as efficient as the EPA numbers suggest? I’ll find out as I spend a few more days in the 2013 Buick Encore.